If you have a friend who has a baby boy on the way, do you know what you are going to give her at the baby shower? You want to give something that is meaningful and comes from the heart, but that will also come in handy for a mom. So, what is it going to be? 1. Decide on fabric and a pattern. Plenty of ideas can be found online. 2. Cut out the pattern. This is one of the more delicate steps in the process. It has to be done precisely or the quilt won’t come out right. Create the pattern of your choice by sewing the blocks together. Do so with a ¼” seam allowance. 4. Put a border around the quilt. 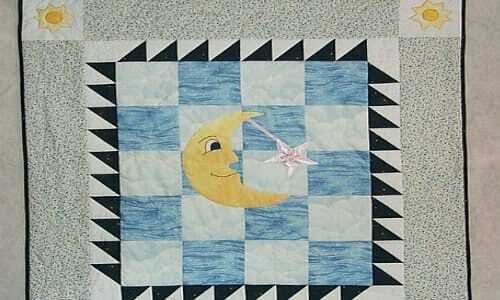 This is an optional step, but if you don’t have enough blocks to make the quilt as big as you had planned, the border can help. High loft batting makes for a thicker and warmer quilt, but low loft batting is easier to put together. Backing material has to be a few inches bigger than the quilt from every side. 7. Baste the three layers to one another. Sew them together with a thread. Remove the thread afterward. Use your sewing machine for this part. 9. Finish the edges of the quilt. You may have to remove the basting here. You can write the boy’s name (if the mother has decided on one yet) or a short inspirational message.